At Barretts Land Rover we have a number of All-New Discovery offers available, and we can even tailor an offer specifically for you, so you get the Discovery you want at a monthly repayment and deposit that suits you. Speak to a member of our friendly team today for your no obligation quote. Representative Example relates to Discovery 2.0 SD4 240ps SE Auto (19MY). The All-New Discovery is the latest member of the Land Rover family to be updated with state-of-the-art design and best in-class off road capabilities and performance. It is our most versatile SUV yet, with its revolutionary design and unrivalled Land Rover capabilities, the new Discovery is ready to partner with any active lifestyle, wherever the road takes you. The very latest vehicle and infotainment technologies have been incorporated to deliver the highest levels of capability, connectivity and entertainment. From the choice of Meridian™ audio systems to innovations such as InControl Touch Pro, and a suite of ingenious driving, parking and towing aids, there’s a world at your fingertips. You can then look forward to a comfortable driving experience all year round with the option of heated seats across all three rows and heated and cooled front and second row seats. Dependent on your model selection, both the driver and passenger can set their preferred temperature independently via the Touchscreen. All-New Discovery also features optional third row seats with Intelligent Seat Fold, which allows you to configure the second and third row seating using switches in the load space, on the main Touchscreen or via your smartphone with our InControl Remote app. With class-leading legroom you can set out in comfort, prepared for any adventure. The new Discovery embodies Land Rover’s drive to go Above and Beyond, combining British desirability with an unstoppable spirit of adventure. The fifth generation model has evolved with its curvaceous and sleek lines allowing for 480 kg reduction in kerb weight aiding greater efficiency and economy. Land Rover have designed the new Discovery with seven adult sized seats which are power operated using either in car controls or a unique smartphone app allowing for unrivalled ease and configurations. Cabin space has further improved with a 140mm increase on the out going model with luggage space more generous than ever. The availability of up to 5 ISOFIX points makes it easy to install child seats. They also ensure a strong connection between the child seat and the vehicle for improved safety. Discovery has been awarded the maximum five star safety rating from Euro NCAP – the European New Car Assessment Programme which ensures cars are safer. In all variants, including seven seat models, all seating positions are assessed to ensure a high standard of occupant protection. There are four engines available in the All-New Discovery including Land Rover's new 300HP 2.0 litre four cylinder Ingenium petrol engine combining modest CO2 levels with fuel efficiency all paired with an eight-speed ZF automatic gearbox. This Discovery is claimed to be Land Rover's most capable off-roader yet with thanks to its improved wading ability, increased ground clearance and lighter chassis weight. Incorporating a sustainable new design and intelligent material choices, the new model has reduced emissions on its predecessor and is 480kg lighter. Using aluminium as its core structure, the All-New Discovery can be enjoyed with greater levels of performance, strength and efficiency. This lightweight feature enables unrivalled comfort and versatility throughout any off-roading adventures. Prices range from £45,895 to £65,695 with four equipment levels to choose from S, SE, HSE, HSE Luxury and the new addition SVX. The new Discovery SVX makes the impassable possible with a range of new and advanced technologies to set it apart from anything else. Terrain Response 2 - Robust aluminium underbody, increased ground clearance and optimised terrain detection. Wheels - 20" forged alloy wheels and 815mm rolling radium tyres. Pistol Shifter - Enabling quicker gear changes with a simple fore and aft movement to tackle off-roading. Seating - Unique colour and material combination to enhance the space and durability inside. Engine - 5.0 litre V8 supercharged with 525hp and 625Nm. Design - Bumper additions and Tectonic Grey body colour. SVX Activity Key - Wear the Activity Key instead of using your vehicle key for extra convenience in the outdoors. £54,660 On The Road: Enquire now at Barretts Land Rover. 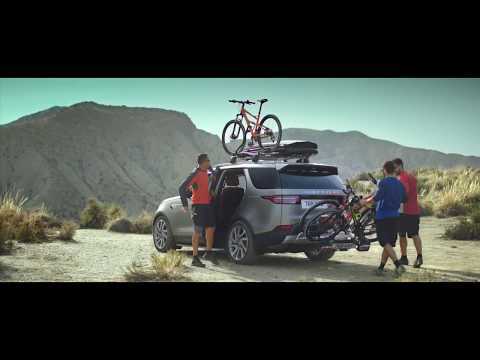 Flexible Finance Available: Contact Barretts Land Rover for your tailored finance quote. We will give you £3,500 towards your deposit: Deposit contribution based on finance example.